Last night, our Minor League Stadium Crawl returned from a brief hiatus with a visit to Skylands Park in Augusta, New Jersey. Augusta, if you haven't been, is located about 50 miles northwest of Manhattan in Sussex County, but it might as well be on a different planet. There's a tractor-crossing sign not a quarter-mile from the stadium, and inside, promotional posters feature various farm animals in a Skyhawks cap, with slogans like, "I'm tired of being the goat! I wanna be a Skyhawk!" We may have lamented the dull surroundings of Suffolk County Sports Park, but Central Islip is the freaking theater district by comparison. Last night's game — a 16–3 Skyhawks rout of Les Capitales de Québec — drew lots and lots of families, with kids taking part in such activities as "cheering on the Skyhawks," "hanging out in the picnic area in left field," and "beating each other with Thunder Stix." So how does Skylands Park stack up? On to the rankings! Facilities: In our look at the Long Island Ducks' stadium, we lamented the lack of charming nooks and crannies at the Suffolk County Sports Park. Well, it's pretty much the same thing here: This is a baseball stadium straight out of central casting. (Also, may we take a moment to sadly shake our head at the lack of devotion to quality foul poles at Minor League stadiums: This one had one barely taller than Luc Longley.) At first sight, it appears the left- and right-field walls are tall, Citi Field–esque, but when you look closer, you realize they're just billboards with local ads, a few feet behind the fence, just an excuse for the nearby oral and maxillofacial surgeon to peddle his wares. Two more downsides here: A public-address system with microphone quality on par with subway announcements and bugs, bugs, bugs. We were bitten by everything but the mascot last night. One goofy upside: We had no idea anyone played Lee Greenwood's "Proud to Be an American" anymore. Rating: 2/10. 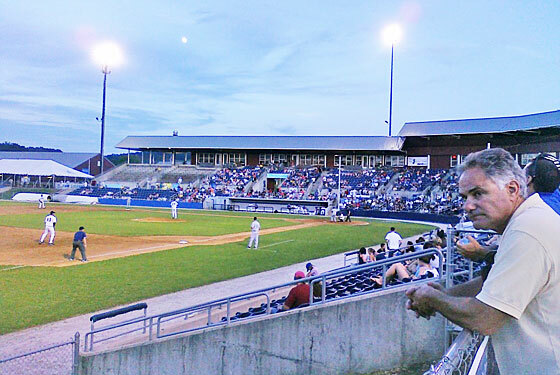 Quality of Play: The Skyhawks play in the Canadian-American Association of Professional Baseball, which is actually a few steps below the Atlantic League. Whereas the Long Island Ducks had a portly but still moderately effective Sidney Ponson, this game had no former major leaguers other than one-time Met reliever Duaner Sanchez, whose career has collapsed since he was involved in a taxicab accident with a drunk driver a few years ago. The players out there were far from skilled, but that didn't bother us so much: This is independent baseball, after all. What stuck in our craw was the repeated lack of hustle by the players. We are not David Eckstein fetishists, but one would think, when you're playing at this level, you'd run out ground balls and occasionally at least PRETEND to try to score from second on a single to the right fielder. Special scolds go to Skyhawks center fielder Kraig Binick, who simply refused to tuck his jersey in. Tsk tsk, Kraig: Play like you've been there before, son. Rating: 3/10. Promotions: The cover of the game program promises $1 beer nights, but beyond that, the offerings are pretty boring. There's a bunch of fireworks nights, but very few giveaways, and most of the so-called promotions revolve around themes like Contractors Day and Virgo Night. (Last night's promotion: "Score an A" Night, which rewards local kids with free tickets for participating in a reading program.) Everyone was, however, handed a voucher for a free ticket on July 4 on their way out of the stadium, so there's that at least. Rating: 2/10. Adorability: We understand that Minor League teams don't have the budget for fancy scoreboard races or sponsored groundskeepers dancing to Village People songs, but the Sussex Skyhawks aren't even trying. One of the between-innings games for kids actually involved two children running to pick up a cardboard box, put it over their head and then run back. In the slums of Jakarta, they would consider that low-rent. (Another favorite: How long will it take you to pop a water balloon?) Also: One of the more charming aspects of baseball is the seventh-Inning stretch: After all, it's two minutes where everyone just stops and sings a song together. Here, they don't even give you a cue: The minute the top of the seventh ended, that awful public-address system just started piddling it out, and before anyone realized what was happening, the song was over. Then: "Cotton Eyed Joe." Ugh. Rating: 3/10. Miscellaneous: Here's how we scored this category for Skylands Park: It started with the full ten points, and for every fifteen minutes it took us to get there by car from Brooklyn, we deducted a point. This left Skylands Park with a score of negative two. Since public transportation isn't a viable option, if you're traveling from the city, you can expect a similarly nightmarish trip if you hope to arrive for a 7:05 weeknight start. We will, however, award the Skyhawks points because the structures that comprise the stadium are designed to look like barns, which works well in this setting, and for using what appeared to be the Rangers goal horn to celebrate home runs. Rating 2/10. TOTAL: 12. If you're already west of the Hudson, attending a game at Skylands Park doesn't require such great effort and might provide a relaxing night out (unless you're one of those kids getting whacked in the head by your friend's Thunder Stix). But if you're not from Jersey, you're probably better off following along with the team's really detailed live-blogs. With two venues down, the Long Island Ducks' Suffolk County Sports Park remains in the lead with a score of 18. Next up: A visit this coming Monday to TD Bank Ballpark, home of the Somerset Patriots.